Are you looking for an attractive vehicle with an attractive price? The new Honda Insight fits the bill with elegant exterior styling, upscale interior finishes and a price point to fit most budgets. This beautiful four-door sedan is also a hybrid so the savings continue at the pump. 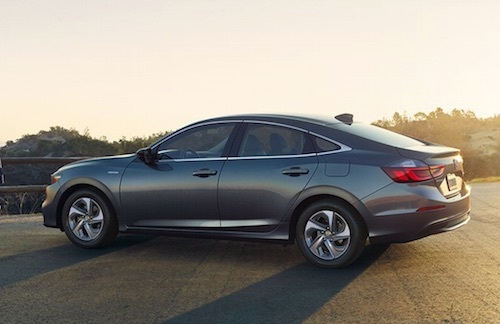 The new Honda Insight Hybrid is well equipped with a multi-angle rearview camera, safety and driver assist Honda Sensing® features and a choice of three drive modes: ECON/Sport/EV. The Insight also offers versatility not found in other sedans. With a fold-down rear seatback and flexible seating configurations this Honda car has ample room for passengers and cargo alike. Browse our new Honda Insight inventory to see photos, color options, trim levels and vehicle details. Our finance experts will answer any questions about Honda financing or leasing and we are happy to explain the benefits of both. The Ed Voyles Honda finance team can also help you identify current dealer offers so you are sure to get a great price and low monthly payments. We invite you to learn more about this exciting new hybrid and come test drive the new Honda Insight near Atlanta, GA soon.